The new Blick 906 Model II is an economically priced press with a 13¾" wide bed plate that incorporates many features of larger presses. It's an excellent choice for the junior high or high school classroom as well as the individual art studio. It's gear driven for easy pulling of etchings, dry points, engravings, collagraphs, linoleum block prints, and paper plate lithographs. Calibrated pressure adjusters allow you to see exactly how much pressure is being applied. 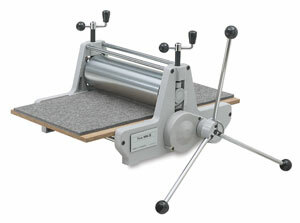 The 4½" diameter lathe-turned solid steel upper roller can be raised to accommodate mounted linoleum up to 7/8" thick. Total clearance without blankets is 1¼". Maximum print size is 12" × 25" with the 26" long bed plate, and 12" × 35" with the 36" long bed plate. The bed plate on the 906 Model II is ¾" wider than the original 906 press. Purchase your choice of steel or phenolic bed plate separately. Phenolic is lighter weight, but is very strong and made of non-rusting, reinforced resin. Each bed plate comes with a ¼" gray cushion blanket. We recommend the purchase of a catcher blanket and a pusher blanket.